The Archaeological Sites of the Island of Meroe contain the best preserved relics of the Kingdom of Kush at the height of its power. 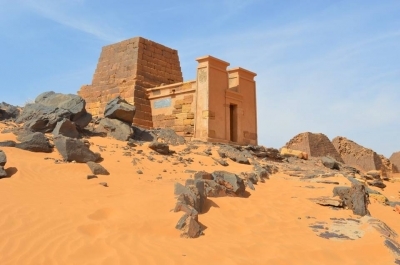 Meroe became their principal residence in the 3rd century BC, after transferring the royal burial ground from Napata (Gebel Barkal). Its proximity to the Nile made it a viable location for human existence. The nominated area consists of 3 parts: the royal city of Meroe (town and cemetery), and the religious sites of Musawwarat es-Sufra and Naqa. Most notable are the more than 200 pyramids that have survived. The city's downfall started in the mid-4th century, after being captured by the Kingdom of Axum. After I had visited the excellent Gebel Barkal, I wondered if Meroë could surpass it. Well, it did. I do not hesitate to compare this collection of 4 archaelogical sites in the heart of Sudan with Jordan's Petra. Meroë is testimony to the period when the Black Pharoahs of Nubia found their own style: less Egyptian and more African, with far-reaching trade connections. The focal point of the nomination is the pyramid field of the Meroë Necropolis, where about 100 structures are clustered. It lies within sight of the busy tarmacked road between Khartoum and Atbara, with mainly trucks and buses plying the route to Port Sudan. The pyramids here have been uncovered since the early 20th century. The reconstruction of their characteristic pylon gateways or votive chapels often dates to as recent as the 1990s. Fresh sand covers the entrances to these chapels every day, making it still adventurous to tread and explore. Most are empty inside, but some have carvings or paintings so it's worth to just check them out one by one to see what you find. A few kilometres away, on the other side of the modern road, lie the remains of the former city of Meroë. This is mostly just ruins now, but you can see the size of it all (it had 25,000 inhabitants in its heyday). A Roman-style bath house has been discovered here. Nature is slowly taking over the site again: due to restrictions on wood collecting, an acacia forest is starting to regrow. We saw some fine birds here, such as a hoopoe and a small owl. Musawwarat es-Sufra covers the third location of this WHS. It lies in the desert 35km inland of the Nile and 40km south of Meroë. The site of Musawwarat (meaning 'pictures') holds a monument that could be a WHS in its own right: the Lion Temple. This is a beautifully restored sandstone structure covered on all four sides with almost complete bas reliefs. They show local and Egyptian gods and goddesses, kings and queens with African hairstyles. The temple is dedicated to the typical Meroitic Lion God Apedemak. German archaeologists have 'adopted' it since the 1950s, and have pieced it together again carefully. Really great WHS produce a Wow!-feeling when you see them with your own eyes, and the reliefs of Mussawarat did the trick for me. Naqa is the fourth location that comprises this WHS. It lies not far from Mussawarat, in a similar desert setting. The serious photographers and video shooters in our tour group were immediately drawn to a pastoral scene near where we parked (some even never bothered to enter the archaelogical site itself). All people and animals living in the wider area seemed to gather at this spot, where water was being collected deep down from a well. Two donkeys did the hard work, pulling the long rope connected to the bucket downhill. I prefer looking at old buildings above pestering locals, so I followed our Sudanese guide into the grounds. Naqa is the site where the Nubians of the Kushite empire show that they've been in contact with Roman / Hellenistic structures. Neighbouring Egypt was a Roman colony during the Meroitic Kingdom of Kush. Naqa's 'Roman' kiosk, a small temple, shows familiar capitals and arched windows. There are also two larger temples on site, both again with large bas reliefs on the outside. One carving shows a bearded Greek, not far from where our 19th century friend Prince Pückler left his mark. The sites in and around Meroë seem slightly more visited than those at Gebel Barkal, probably because of the relative proximity to the capital Khartoum. The Pyramid fields of Meroë even are fenced off (a rare sight in Sudan). There are souvenir sellers at the gate, and guys that offer camel rides. It's all still low-key of course, but Meroë is the center of Sudanese tourism and rightly so. The site saw 6000 visitors in 2010, I wonder how high the numbers are nowadays. 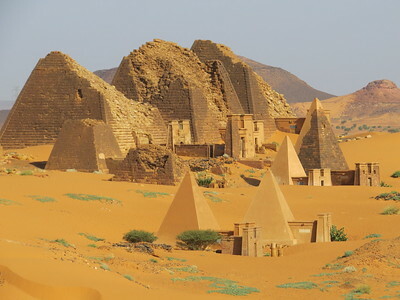 As soon as you enter Sudan, you can see each and every advertisement that have the slightest connection with tourism having the image of the pyramids, and that implies that Meroe is the crown jewel of the Sudanese tourism, and its relative closeness to Khartoum makes it the most touristy place in the whole country. But do not expect crowds of tourist flocking the ruins. When we visited meroe last December seemingly we were the only foreigners there. The presence of desperate souvenir sellers and guys who offered rides on their camels shows that there were better times, and maybe there are days when there are more people coming. The site consists of two major parts, the capital of the Meroitic kingdom, and its necropolis. The capital is a bit more far away from the main road. it's more or less completely ruined, you need an extremely good imagination to see the lush palaces and pompous temples of Egyptian and local gods in the less than a meter high cramped walls. But the scenery with the trees offering a shadow for the exhausted traveller is impressive and with a knowledgeable guide it can be a somewhat interesting experience. On the contrary the necropolis in the red desert is touching for the first sight. One of the most impressive sites I've ever seen. The pyramids are much smaller than their Egyptian brothers and much younger too, but not less interesting or mysterious. The black stone buildings in the reddish desert are utterly photogenic. And what it lacks in the grandiose measures it compensates in numbers. You can find places on top of the small hills where you can spot dozens of pyramids. Reconstruction is under way and some pyramids are already covered with white plastered stones as they were in the time they were built. You can enter some of them, but do not expect mysterious deep burial chambers inside - there are small burial chapels in the pyramids with some reliefs on the walls. If you have a car it's not difficult to get there from Khartoum. The necropolis is on the side of the (new) Khartoum - Port Sudan highway cca 350 kms from Khartoum. Beware that not only a means of independent transport is needed if you want to go there - getting there by public transport could be a great challenge as there are no modern settlements around - bur you need a special permission from the Ministry of Interior to leave the capital. There is at least on checkpoint where you have to show it. Allow a whole day for Meroe with early morning departure from Khartoum. There are no restaurants of food stalls around so either take food and drinks with you, or stop at a roadside eatery. The main site (the one with the pyramids) is easily accessible from the highway north of Khartoum. Buses can drop you off. The ruins of Meroë town are just a few kms away, but too far to walk in the heat - maybe you can persuade a camel driver to take you there. The other 2 locations (Mussawarat and Naqa) are remote and need private 4WD transport. Desert Cultural Landscapes: Crit v "The major centres of human activity far from the Nile at Musawwarat and Naqa raise questions as to their viability in what is today an arid zone devoid of permanent human settlement. They offer the possibility, through a detailed study of the palaeoclimate, flora, and fauna, of understanding the interaction of the Kushites with their desert hinterland."